"Moon Serpents!" Astronaut Bud Barclay gasps into the microphone of his space suit. Tom Swift Jr.'s investigation of the phenomenon reveals that the giant, writhing reptilian forms are caused by gas vapors. When Tom captures a sample of the gas in a metal flask for analysis, he shoots up from the moon's surface into space! Through quick thinking the young scientist-inventor rescues himself and realizes that he has discovered a new powerful energy, which he calls Serptilium. At this time, a large railroad network is in the market for an advance method of rail travel. A contract will go either to Swift Enterprises or to a rival firm, Cosmoprises -- whichever designs the best super-speed train. How Tom, using Serptilium, develops his invention and defeats Cosmoprises' evil attempts to win the prized contract makes exciting reading for all Tom Swift Jr. fans. The only major invention in this book is the G-Force Inverter. Tom built the Inverter to harness a very strange gas called Serptilium that he found on the moon. The G-Force Inverter is the engine of a super-fast train (called the Monoswift) that Tom built for a railroad company. Using his g-force inverter the Monoswift can be propelled to speeds over 300mph. Tom explained that he had constructed a double-walled, peripheral chamber around the one containing Serptilium. He had found that by sending a flow of Cryotol [a catalyst that his Father had invented; it liquefies gases at higher temperatures than normal] through the outer chamber, a propulsive force was produced. "Instead of a solid rail, I plan on using a special, hollow cable which we'll fill with Serptilium. Then we'll encase the cable in a heating element to vary the temperature of the gas and thus control the amount of minus-G force produced. It will literally float above the ground." How feasible is it to build a G-force Inverter? 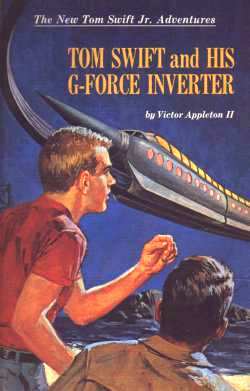 A G-Force inverter completely requires an anti-gravity gas. Thus, until an anti-gravity gas is invented, the G-Inverter cannot be built. How much impact would a G-Force Inverter have on civilization? The G-Force Inverter would have a huge impact on society, mainly as a nearly unlimited source of energy. Serptilium, too, would be used in all kinds of projects -- an anti-gravity gas could be very useful. The true usefulness of the G-Force inverter, though, hangs on two very important questions: how much does it cost to run, and how can it be used? If Serptilium is a true anti-gravity gas there would be hundreds of uses for it. Planes could use it to lighten -- or eliminate -- their weight. Rockets could use it instead of costly rocket engines. Gravity-defying buildings could be designed. Bridges could be made stronger, lighter, and cheaper. The propulsion side of Serptilium is also interesting. Serptilium could also serve as a safety device. A few cans of it, for example, would forever eliminate the possibility of a plane crash due to engine failure. (Wouldn't it be a sight to see a plane stranded at 30,000 feet?) Boats could use it to keep from sinking -- if there's ever any danger, just flip a switch and up she goes. Serptilium might also be able to turn into a rather interesting parachute or life preserver, but that just might be getting a bit far-fetched.